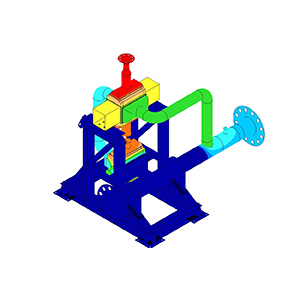 FEA-Solutions (UK) Ltd - Finite Element Analysis For Your Product Design | 260: Compact Heat Exchanger Assembly Heat transfer and stress analysis of an assembly of two compact heat exchangers with headers, piping and mounting frame, subjected to a considerable number of load cases and load combinations. Result superposition used to eliminate the effects of load orientation. Ten design iterations analysed.